Close to Gauteng, the North West Province is a quick and easy escape from the big city. In the North West Province the best known destination is fabulous Sun City resort complex - where you can gamble, eat, watch entertaining shows and just stare at the fantastic architecture of the Lost City. There are two Gary Player-designed golf courses, horse rides and a rather large water park for outdoor amusement - even a 'beach' with fake sand, real palm trees and artificial waves.Next door to Sun City is the Pilanesberg Game Reserve that offers the opportunity of seeing the Big Five in a particularly scenic environment. 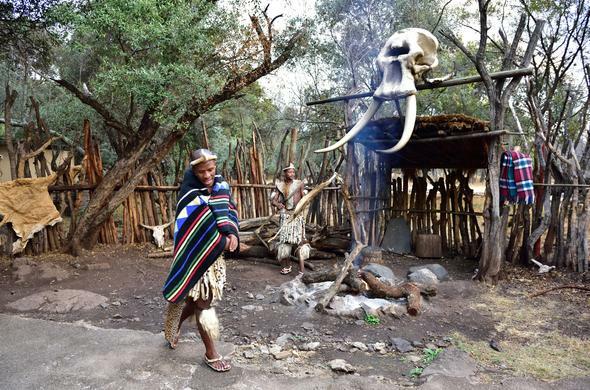 There are 3 lodges in the park, of which the most attractive (and most expensive) is Tshukudu and the parks board accommodation is very comfortable too. You can drive yourself around the park or choose to do a guided drive or walk. Most fun, though, would be a hot air balloon ride. Although it's not easily seen, much of the park's interesting relief is due to the fact that part of it consists of an extinct collapsed volcanic crater.The other major park in the province is the Madikwe Game Reserve, which is best known for its sizeable population of the beautiful and endangered African wild dog. Accommodation in the park ranges from a relatively inexpensive but fun camp to luxury lodges. The park is situated on the old route into Botswana and there are many tall tales told about the journeys north through there. The best place to hear them is at the bar in the small town of Groot Marico. It was here that author Herman Charles Bosman lived and taught at the local school. After lessons, he would write hilarious anecdotes about his fellow citizens and their drinking habits, with a wry fondness. It's worth trying to get a copy of some of his work. While in Groot Marico, you can do a mampoer (similar to moonshine) tasting trip. Although it's not the provincial capital, Mafikeng is the largest city in the province. It boasts a variety of contemporary African building in Tswana designs and colours.